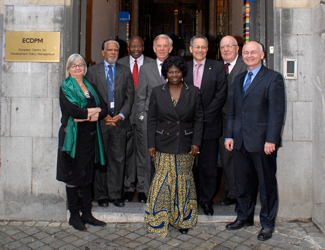 The ECDPM Board of Governors is composed of highly respected policymakers, practitioners and specialists from countries in Africa, the Caribbean and the Pacific and EU member states. The full Board convenes twice a year. The Board chooses from its midst an Executive Committee and Programme Committee. The Executive Committee meets at least three additional times each year. Among other things, it reviews the mid-year and annual balance sheets and income and expenditure statements. The Programme Committee meets twice a year to review the ECDPM annual work plan and annual report. At the end of 2013, ECDPM had 63 staff members, 35 of whom were women and 28 men. 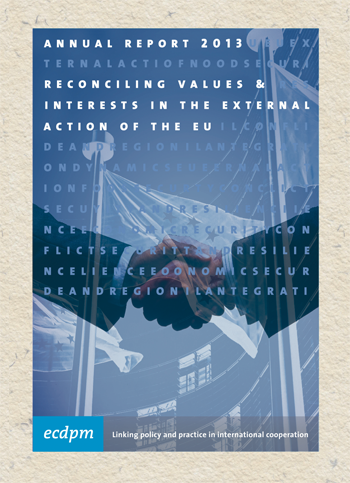 Among these, 53 were based at the head office in Maastricht and 10 operated from ECDPM’s Brussels office. The Centre employed 40 programme staff members, of whom 18 were junior policy officers and research assistants. Its support staff numbered 23, or 16.6 full-time equivalents, working in administration, IT, communications, publications and human resources. In addition to the regular staff, nine programme associates collaborated closely with the Centre in 2013. ECDPM further worked closely with a network of specialist consultants. ECDPM staff represented 22 nationalities at the end of 2013: Algerian, American, Australian, Austrian, Belgian, British, Cameroonian, Canadian, Dutch, Ethiopian, French, German, Irish, Italian, Mauritian, Mauritanian, Namibian, Portuguese, South African, Spanish, Swedish and Swiss. The Centre strives to provide opportunities for young professionals, especially those from countries in Africa, the Caribbean and the Pacific. In 2013, we kicked off our Young International Professionals Programme (YIPP) in collaboration with partner institutes and peer organisations. This programme builds capacity among talented young professionals from the ACP region in the area of international cooperation, by recruiting them to ECDPM for a minimum period of seven months and a maximum period of one year. We awarded nine internships, seven research assistantships and 11 programme assistantships to university graduates in 2013, providing them an opportunity to work in a stimulating environment and gain international exposure. These postgraduates have outstanding intellectual qualities and personal strengths, hold a master’s degree in development, social studies, international affairs/relations, communications, law or economics, and have specialisations relevant to ECDPM’s work.